There are other methods of scrying other than with the crystal ball. Bear in mind the principles are all the same. The scrying medium doesn't matter so much -- it all comes from within you. Find a medium that you feel comfortable with for starters. You'll find you have the ability to use them all as you gain experience. Fire scrying is a very common method and requires only a flame of some sort. It's also one of the easiest methods as the flickering fire has a hypnotic effect. You can gaze into any fire -- your lit fireplace, a bonfire, campfire, candle flame, or even a lighter. Give me now the secret glance. Make me psychic with your light. Give me now the second sight. Repeat until your eyelids grow heavy. Divine the future within the fire's restless flames. I sit before the candle, as still as possible and stare into the flames. If you've been practicing your breathing exercises, you should fall into attunement with the flame in a short time. Quiet your mind, relax, and wait. If scrying for a particular purpose, fix your mind gently on that while gazing. As I said earlier, the flickering flame is a great aid in getting into the proper trance state. Let me say here that I'm not one who sees scenes unfolding like a movie while scrying. I get images -- usually cryptic ones. I once watched a bat unfold from the flames. It seemed very real. But usually while scrying I'll get images in my mind. Often the strength of your desire to know the answer to your question will affect the speed, intensity and clarity of the answer you receive. Trust your subconscious because this is where your true natural abilities manifest. You may not even see anything in the scrying tool, you may receive the answer to the question in your mind as if by telepathy, or the answer may come to you later, perhaps in a dream. The most important thing is to believe in yourself and your abilities - believe it will happen, and if your intent and belief is strong enough, it will happen. Here are two good fire scrying articles from Widdershins e-zine. About wax scrying: After the spell is cast, I gaze at the designs the wax has made while melting. If I can divine a shape in the wax, I translate the symbol for further insight. For instance, in a spell to draw love to yourself, you might see a heart in the wax. That would be a good sign as the heart symbolizes love, passion, fulfillment, etc. First, make your own magick mirror. Some people "lock" the powers of their mirrors to their use alone by charging it with a secret, magick word. You can do this while cleansing and consecrating your magick mirror by placing your finger on the mirror's center and saying your magick word three times. Between speaking each word, remove your finger from the mirror and breathe through the spot. Allow your psychic energy to mingle with the mirror's. To use your magick mirror, place a votive candle behind the mirror (the mirror will obstruct your view of it) or light two candles on either side of the mirror. (Personal preference). Hold your hands over the black surface and whisper your magick word three times. Gaze into the mirror's blackness -- not on it, but through it. Again, relax your mind and use the usual scrying techniques we've already learned. Another mirror method is to sit under the full moon with your mirror. Catch the moon's reflection in the black mirror and begin scrying into this reflection. 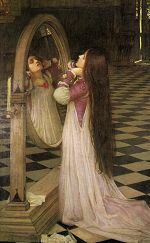 Here's a nice page about scrying with mirrors. It's easy to construct your own black bowl. Simply buy a black bowl, use your cauldron, or paint the outside of a clear pyrex bowl flat black. The black bowl uses water as its scrying surface, and water is a natural conduit of psychic visions. Use water, ink, herb tea (mugwort would be good), or sacred water. Stir in three teaspoons of sea salt. Begin your waters during the third quarter of the moon. Sit the mixture in a sunny spot where it will be undisturbed until the last night of the fourth quarter of the waning moon. (9-16 days, depending on when you start). If the water gets low, add one-half to three-fourths cups water. When it has "perculated" sufficiently (it will look like tea), strain off the herbs and save in a jar for divination. If using clear water, drop a crystal or shell into the bowl. This will aid in your focus. Scry as usual. Sometimes all we need is a simple a yes/no answer. Pendulums work great here, although they can get much more specific than that. Yes, you can go to a metaphysical shop and spend $20-50 on a precision-balanced pendulum and chain, or you can make your own. Tie a thin white or red natural string to a golden ring, a needle, a crystal tip, acorn, hazel nut, or herb bundle. Hazel nuts make particularly good pendulums as they are associated with wisdom, occult knowledge, and dowsing. To make an herbal pendulum, tie a string tightly around one end of an herb bundle. Telesco in _Spinning Spells, Weaving Wonders_ recommends bay leaf or garlic buds. You could substitute any good, small-leafed divinitory herb. In all pendulums made with string, leave enough string so that, when held at one end, the pendulum can dangle freely from the other. Before using your pendulum you must charge it. There are various ways of doing this. The important thing to remember is that whatever works for you is best. Hold the string in your hand between the thumb and first finger, letting the string hang down. Tell your pendulum which direction will indicate YES. It can be clockwise or counter-clockwise or a straight line - either horizontal or vertical. You decide. Then tell the pendulum to indicate NO. This time tell it to move in another direction. After you've charged it, ask it to show you YES and see it it moves as you had directed it. Do the same for NO. In the early stages of use, it is best to ask it to indicate the yes/no response on a regular basis. It can change as you get more proficient with it. Pendulums work directly from our subconscious -- the basis of using a pendulum is ideomotor action. Ideomotor action is when thoughts or ideas are automatically translated into specific patterns of muscular activity. An idea can cause involuntary muscular movement. The pendulum works by measuring ideomotor response when we question ourselves. It works on the same principle of the lie detector. The involuntary muscular response is translated as answers on a chart by the direction of pendulum movement. This process bypasses the conscious mind or ego. It allows direct access to information from the subconscious. The pendulum has no power of its own. Your thoughts and muscle response bring about the pendulum's motion. Again, (say it with me) it all comes from within you. Pendulum dowsing takes a lot of practice. But if you keep at it, you'll become very good at it. Mugwort, mugwort, mugwort. LOL! Can you tell I have an affinity for this herb? Believe it or not, there are lots of others you can use. Below are some recipes. There are many different sources for divination teas and simples and drinks of all kinds. Put these in a pot and pour boiling water over them. Allow them to steep for several minutes, then use the scent of the brew to improve your psychic awareness by inhaling the scented steam, you may even drink a bit of the brew to assist you in this. Put these in a pot and pour boiling water over them. Allow them to steep for several minutes, then strain and drink it to assist you with divination and scrying. Bring the water to a boil on the stove and then add it to your cup with the herb already added. Let it steep for ten minutes and then strain it with a non-metallic strainer. If the taste is bitter you may sweeten it with any type of natural honey. Use mugwort drunk for clairvoyance, yarrow to improve psychic powers. Eyebright is brewed and then eyelids are anointed for clairvoyant visions. No matter what form of divination tool you use, the real skill lies in trusting your own intuition. Witches of old didn't scour detailed books for information on these forms of divination -- they let their insight rule. The only way to truly divine something is to focus on the image the scrying tool gives you in relation to the question or problem and see what thoughts and images come to mind. True divination comes from the Divine, it's an intuitive art learned only through practice, not book learning. Good luck and happy scrying!